A pack of out of control dogs raced into an elderly woman's garden during a stand off between hunters and masked hunt saboteurs. Shocking video captured the moment up to 20 hounds tore across a road in the village Billingborough, near Sleaford, Lincolnshire during the Belvoir Hunt. 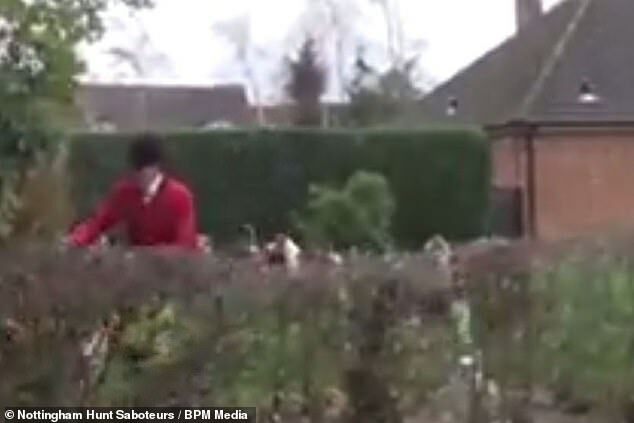 The clip shows them being followed by riders wearing traditional red hunting jackets as they make their way through a hedge onto a resident's front lawn. Saboteurs are then filmed running into the garden to try and force the dogs out, as a huntsman dismounts and attempts to get control of the pack. He later goes to speak to the homeowner to apologise after she comes outside to see what was happening. Nottingham Hunt Saboteurs, who were protesting the meet on December 4 and filmed the encounter in a video they put on its Facebook page, then warn residents in the road to get their pets inside.